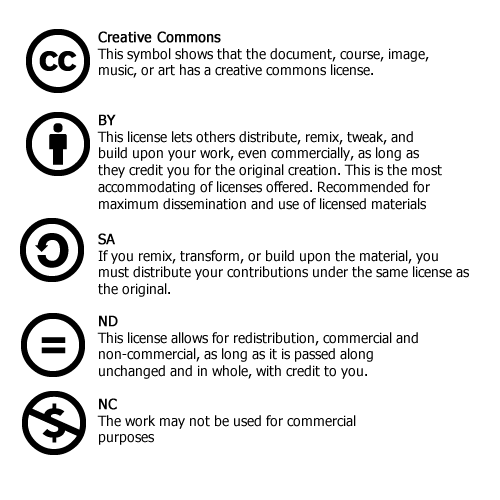 Creative Commons licenses provide a flexible system that allows creators to customize their copyright permissions. This enables individuals and organizations to share their work for re-use while still retaining specified rights. Creators may opt to allow others to copy, distribute (commercially or non-commercially), or adapt their works. For help finding the best CC option for your work, visit the Creative Commons choose a license help page. “Creative Commons is a global nonprofit organization that enables sharing and reuse of creativity and knowledge through the provision of free legal tools. Our legal tools help those who want to encourage reuse of their works by offering them for use under generous, standardized terms; those who want to make creative uses of works; and those who want to benefit from this symbiosis. Our vision is to help others realize the full potential of the Internet. CC has affiliates all over the world who help ensure our licenses work internationally and who raise awareness of our work. Although Creative Commons is best known for its licenses, our work extends beyond just providing copyright licenses. CC offers other legal and technical tools that also facilitate sharing and discovery of creative works, such as CC0, a public domain dedication for rights holders who wish to put their work into the public domain before the expiration of copyright, and the Public Domain Mark, a tool for marking a work that is in the worldwide public domain. Creative Commons licenses and tools were designed specifically to work with the web, which makes content that is offered under their terms easy to search for, discover, and use. From Frequently Asked Questions by Creative Commons. More information on licenses is available at the Creative Commons Website. Content on this page is adapted from Creative Commons which is licensed under a Creative Commons Attribution 4.0 International License.